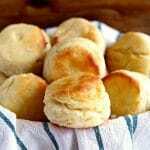 Easy Gluten-Free Biscuits recipe made Southern Style with buttermilk. Flaky and tender. With a dairy-free and Vegan option. Add in the buttermilk and the whisked egg (or egg replacer) and stir until a soft dough forms. (I whisk the egg right in the buttermilk) The key is to not over mix because over-mixing causes the dough to yield tough biscuits. The dough will be sticky. Add one tablespoon of flour to a large piece of parchment paper. PLEASE DO NOT ROLL OUT THE DOUGH. Place the dough on top of the floured parchment paper. Dust the top of the dough with 1 tablespoon of flour and gently fold dough over on itself 2 times. You do this by folding the dough in half on top of itself and then doing it a second time. With your hands form a dough round that is about 7 inches in diameter and 1 inch thick. If you make it any larger or flatter you will end up with hard, flat biscuits. Cut out 2-inch biscuits using a biscuit cutter, the mouth of a glass or the lid of a mason jar. Do not twist cutter when cutting; this will crimp the edges of the biscuit causing it not to rise well. Reform the dough scraps into a dough round and cut out more biscuits. Put the biscuits on a greased large cast iron pan or baking sheet. You will have 12 biscuits to bake. I like to brush melted butter on top of the warm biscuits. Serve warm and enjoy! I test baked with the Bob's Red Mill Cup for Cup, Great Value Gluten-Free Flour and Pillsbury Gluten-Free flour. The Bob's Red Mill flour and the Great Value Flour has sorghum flour in it, which is different from the Pillsbury gluten-free flour. The biscuits made with Bob's Red Mill and Great Value Brand were not as fluffy and the dough was wetter. I have also been told by a reader if you use King Arthur gluten-free flour you will need to reduce the amount of buttermilk to 1/2-3/4 cup. I have not personally tried this recipe with King Authur gluten-free flour. For dairy-free option use Smart balance butter or shortening, almond, cashew or coconut milk. For egg-free use Bob's Red Mill Egg Replacer. The egg-free biscuits were not as fluffy as the regular biscuits but were still flaky and delicious! If Vegan use egg replacer, shortening/Earth Balance butter, and dairy-free milk. The Vegan biscuits were not as fluffy as the regular biscuits but were still flaky and delicious! You can batch make the biscuits and save some for later. Flash freeze the cut biscuits (unbaked) for 30 minutes on a parchment lined baking sheet before placing them in a freezer bag and putting them back into the freezer. When you are ready to make your biscuits bake the frozen biscuits for 15-20 minutes at 450° F. Please watch your oven because all ovens are different.